The banner, wi a hole whaur the communist coat o airms haed been cut out, becam the seembol o the revolution. 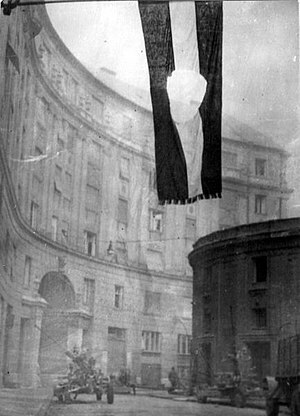 The Hungarian Revolution o 1956 or the Hungarian Uprisin o 1956 (Hungarian: 1956-os forradalom or 1956-os felkelés) wis a naitionwide revolt against the Marxist-Leninist govrenment o the Hungarian Fowkrepublic an its Soviet-imposed policies, lastin frae 23 October till 10 November 1956. ↑ Györkei, Jenõ; Kirov, Alexandr; Horvath, Miklos (1999). Soviet Military Intervention in Hungary, 1956. New York: Central European University Press. p. 370 table 111. ISBN 963-9116-35-1. ↑ Alternate references are "Hungarian Revolt" an "Hungarian Uprisin". In Hungarian, first the term "felkelés" (uprisin) wis uised, then in the 1957–1988 period, the term "ellenforradalom" (coonter-revolution) wis mandatit bi the govrenment, while the new offeecial name efter 1990 haes acome "forradalom és szabadságharc" (revolution an freedom fecht) tae imitate the auld expression for the 1848–1849 revolution. Anither explanation o the terms is that "Revolution" conforms tae both Inglis (see US Depairtment o State backgrund on Hungary) an Hungarian ("forradalom") conventions. Thare is a distinction atween the "complete owerthraw" o a revolution an an uprisin or revolt that mey or mey nae be successfu (Oxford English Dictionary). The 1956 Hungarian event, awtho short-leeved, is a true "revolution" in that the sittin govrenment wis deposed. Unlik the terms "coup d'état" an "putsch" that implee action o a few, the 1956 revolution wis ineetiatit bi the masses. This page wis last eeditit on 2 Juin 2018, at 18:26.